Announcement FREE US SHIPPING on orders over $50! International orders receive equivalent discount when I print shipping label! If you would like to purchase OUTSIDE of ETSY using a PayPal invoice contact me on Facebook (see below) or message me through Etsy. All of my fiber work is done lovingly in small quantities, with the utmost attention to detail. I won't sell anything I wouldn't want to use myself! 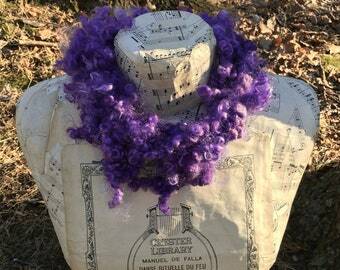 Whether knitting, crochet, weaving, doll making, felting- you will find durable, high quality fiber arts in my shop! Happy crafting! Looking for a unique gift? A wonderful woolen accessory can be knitted or crocheted in a few hours with one skein of bulky art yarn! 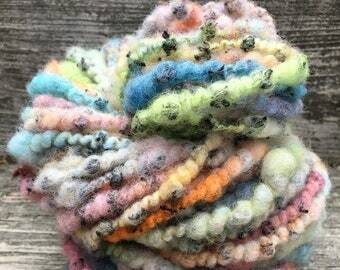 Discover the joy of handspun yarn! My yarns are spun from the heart, using only the finest materials. I realize handspun yarn and hand knitted items are precious luxuries, and I strive to make each one unique and wonderful! You will not find items like this in any commercial store. I buy my fiber from, and therefore support, other independent artists and farmers, seeking out the highest quality possible. 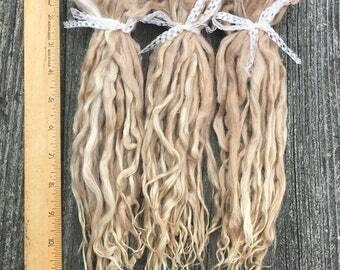 I have taught creative and art yarn spinning and dyeing at many workshops, including PLY AWAY, Utah, Iceland, Namaste Farms. See my "Spin Artiste" Featured Artist interview! Find my article on dyeing long locks in the Spring 2015 Leicester issue of "PLY Magazine"! Some of my handspun yarns can be seen in person at the Jersey Shore! Visit the lovely Great Pacific Frame Shoppe at Point Pleasant Beach, New Jersey, for unique handmade items, yarn, and of course great framing! Click on my Sold section ("Sales") to see a gallery of past yarns, many of which can be repeated. Check out my Ravelry page for items knitted and woven with my handspun yarn; my username is "LauraSpinner". I am also on pinterest http://pinterest.com/lauraspinner/. I have also made many custom yarns used for doll hair on hand-crafted, Waldorf inspired dolls, some of which are in my Facebook albums. Also see "Art Locs" on Facebook for dreadlock and hair accessories made with my art yarn. Please read through my "Policies" section for all sorts of information! See "Shipping" under policies for shipping info- if you have paid more than my cost of shipping I will refund you! FREE US SHIPPING on orders over $50! International orders receive equivalent discount when I print shipping label! If you would like to purchase OUTSIDE of ETSY using a PayPal invoice contact me on Facebook (see below) or message me through Etsy. Fast delivery. I hope to make a weft for my doll. Beautiful Long Locks in my shop! Tailspun Teeswater with natural black Mohair Handspun Yarn. Shawl which I knit from my handspun yarn. I began my love of yarn and fiber as a teen, when my mom taught me to knit. I am a working professional by day, and so creating beautiful yarn and fiber is a true passion of mine. 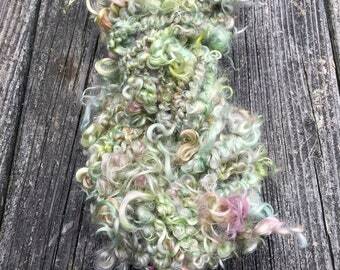 When I first knitted with handspun yarn my universe shifted! The unique look and feel of it, the color and texture and endless artistic possibilities just blew me away. I learned to spin yarn on a spinning wheel from a sheep farmer and took off on my own road to artistic discovery. 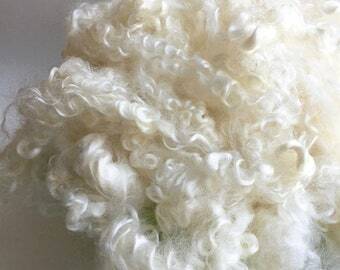 Though I don't own my own sheep, I love to carefully wash, dye, spin, and knit/weave high quality wool fleece and locks. I also love working with people on custom orders, helping make their artistic dreams come true! Handspun yarn is a luxury, I realize that. Hours of work go into planning, spinning, and finishing a handspun yarn. I believe in using, and paying for, the highest quality ingredients/materials and support sheep farmers and dyers with my finished products. I really appreciate every customer. Please remember, behind every handmade object is a real person creating from the heart! My love of knitting with fine handspun yarn drove me to learn how to spin my own yarn on a spinning wheel. I love colors and textures and derive much joy from using them in my work. Now I wash and dye wool as well! Thank you for visiting my shop! I am passionate about fiber, spinning, knitting and weaving. 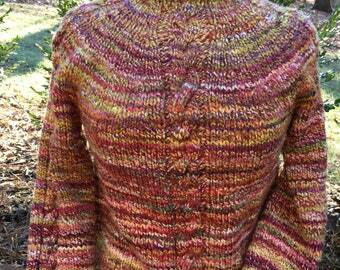 I especially love textured and colorful yarns. I enjoy using fun techniques in my spinning. I am open to custom requests, so feel free to contact me to discuss the options. Please read through the policies outlined below. If you need some ideas and advice about how to use textured/bulky/artsy yarns I can help! If you have a special need for doll hair, such as felting, let me know. If you are dissatisfied with your order in any way, please contact me right away to resolve the issue BEFORE leaving feedback. I strive to be a 5 star seller, and I want you to be HAPPY with your purchase!!!!!!! All of the items in my shop are handmade by me, with top-quality materials and the highest integrity! I strive to display AND describe the items as accurately as possible, though computer monitors and eyes display color differently. Handmade items do have quirks and irregularities which are part of their appeal, but some may not appeal to all customers, so please read the description and look at the photos carefully before purchasing. If you have any questions about the item before purchasing, please contact me. I will accept returns in original condition. I will refund the price paid, minus shipping charge, once I receive the item, so please contact me before returning anything to make arrangements. Unless there is a true defect, the buyer is responsible for return shipping, with tracking. Deposits on custom orders are *non-refundable* if I have completed the order to your request but you have not paid the balance. If I have no response to discuss payment extension by 2 convos I will put the item up for sale in my shop. Paypal, Etsy Direct Checkout (certain credit cards), Etsy Gift Cards. ~ Please let me know if your shipping address is different than your Etsy address when checking out, and which one I should use. Otherwise I will ship to the PayPal address. Orders currently ship within 2 to 4 business days unless otherwise noted. I use environmentally-friendlier packing supplies composed of 88% recycled material. I ship all orders USPS First Class with a tracking number, unless the package weighs over 15 oz.- then it upgrades to Priority per USPS. All international orders are shipped 1st Class International unless otherwise arranged between the buyer and me. There is usually tracking to the US border only. My international shipping policy is that once I provide proof of shipping, all responsibility is out of my hands- I will not file claims or refund money for lost or delayed international packages. I do not include a printed receipt, as this is available online and I'm trying to be as environmentally conscious as possible! As of January 27, 2013 First Class International prices have almost doubled. I have done my best to charge fair shipping prices. However, if you have paid more than $1.50 over my cost of shipping I will refund you! I can expedite your shipping upon request (additional fees apply). I live in a cat-loving household! I try to keep them from romping through the fiber, but you know how it is... So, if you have a bad cat allergy, be forewarned!